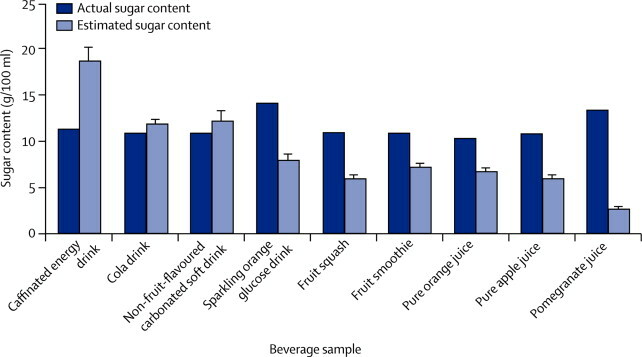 Low Carb Diet News - Tag Archive for "Fruit Juice"
Medical journal article reminds us of the fact that fruit juices very sugary indeedIn a meeting today, my companion asked me about my views on fruit and fruit juice. In short, my reply was that I think fruit is over-rated, and that fruit juice should generally be avoided. Many of the reasons for my ambivalence about fruit (and why much fruit is anything but some sort of nutritional nirvana) is, for me, well articulated in this blog post by nutritionist Zoe Harcombe. Personally, I do eat some fruit, but I don’t go out of my way to eat it either. My issue with fruit juice specifically concerns its very sugary nature. Only last month, our attention was drawn to this fact by a comment piece written in the journal Lancet Diabetes and Endocrinology .